Authenticity is a word often used but rarely adhered to in this materialistic world we live in. The process of being authentic necessitates the requirement to be intentionally transparent. It requires us to be REAL. Who is authentic in your life? The word authentic is defined as: genuine, of undisputed origin, not copied or false, true and accurate, made to look like the original, and having the origin supported by unquestionable evidence. Living AUTHENTIC lives does not mean we are perfect, because we are not. What I am learning, though is that being authentic is being intentionally honest and open. It is a chance to relate to someone else with no ulterior motives, but with a purpose to share a part of my heart with others. I confess, I am a people pleaser, somewhat of a self-proclaimed perfectionist, and someone who probably thinks a bit deeper than I need to at times. Sometimes that combination seems overwhelming considering the whole ‘authenticity’ topic, however, I do strive to be both real and honest in my living as I relate to others. It is perhaps oxymoronic to suggest that a perfectionistic people pleaser, who is hopefully moving forward on a grace-filled road to recovery, could in any way be rationally authentic. Yet, with God all things are possible! How do we become intentionally authentic in this idealistic world of fake? How do we become Real? It is dangerous. We are open to hurt. It is possible we will lose. So why do we want to make the effort? A few scriptures come to mind when I think about this topic of transparent living, written by an apostle whose life was authentically changed by one encounter with Jesus Christ. Paul wrote his letters to the church in Corinth, which was located in Greece. It is noted, historically, as a city of prominence, wealth, learning, and affluence. He was not writing to an unlearned population, but one that was fluent in rhetoric, philosophy, and science. Paul talks about the importance of living lives which are conducted according to the Law of God, not the law of man. Though his views were not always popular, he did not waver in his behavior or his belief. He was authentic. 1 Corinthians 10:31 – Whether therefore you eat, or drink, or whatsoever you do, do all to the glory of God. 2 Corinthians 13:5 – Examine and test and evaluate your own selves to see whether you are holding to your faith and showing the proper fruits of it. Whether or not people agreed with Paul, they were listening to him. They were paying attention to what he said. That is the irony of it. At the Aereopagus in Athens, a place of renaissance and new beginnings, the philosophers eagerly listened to what this man of God had to say, even when it was not in agreement with all that they believed. In their polytheistic belief system, these thinkers had an altar inscribed, “To the Unknown God”, because they wanted to be inclusive to all. Their desire for more knowledge kept them interested in the information Paul had to share. They even extended an invitation for him to speak to them again. That day, the Bible says that some did believe. His authenticity bore fruit and touched lives; it changed them. John 13:35 tells us that people will know us by the fruit of our lives. What does your fruit look like? People are looking for AUTHENTIC people. We often cloak ourselves with veils of fallacy in order to feel like we must fit in, but it’s the courageous one who takes off the veil and reveals the depth of a life touched by Truth. Personally, I am drawn towards a person who walks without the veil. I am easily attracted to someone who has a few scars on their surface and a bit of ‘junk’ in their past. They have the ability to extend grace a little easier, because they, too, have known grace. (Luke 7:47) I think that at our core we all want to connect with real people, even if it is frightening, because we want to have the freedom to live authentically. That is what we are meant to do. Be free to be authentically YOU! When I think of the kindred spirit blessings in my life, those whose transparency preceded my knowledge of them personally, I smile. One dear friend felt the need to tell me all the bad things first, just so I knew. What was hard for me to believe was that there was a possibility, in their thinking, that I may actually think less of them for that. The genuine honesty touched my heart so deeply that it only drew me to them even more. There is something genuinely freeing about living a life of authenticity. You can’t HELP but be exactly who you are and if you try, you become miserable. Not just for you, but for others. When we do that, we all miss out. You have so much beauty on the inside of you. 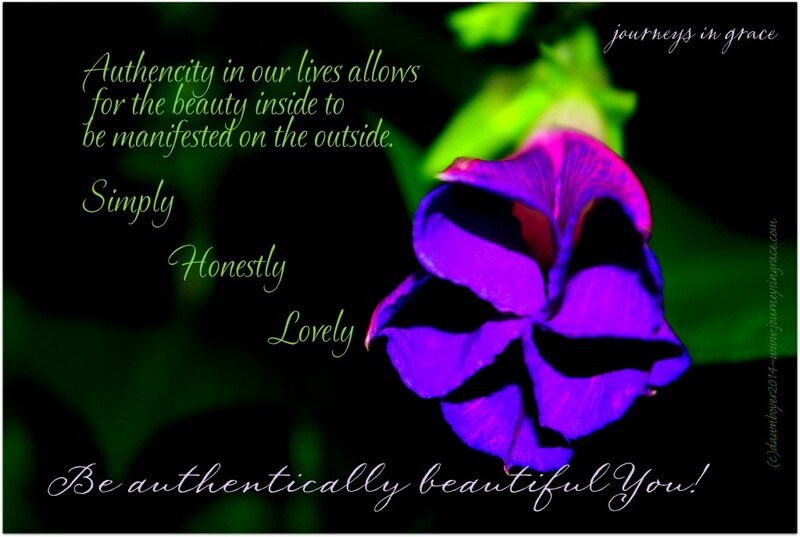 Authenticity allows the beauty inside to manifest on the outside. Simplicity authenticates the goal of the gospel living in our daily pilgrimage. It gravitates toward the purpose of mission-minded living and serving one another in love and in faith. As I consider how Paul related to the theologians of his day, I realize that he didn’t press his opinion but rather he shared his ideas. He responded honestly when asked a question, not worrying whether they agreed. He was free to be REAL, knowing that as thinkers they were interested in what he had to say. He expounded upon those ideas that were real, relevant, and relational to the crowd. He met them where they were. Just like Jesus meets us exactly we are, every single day. Imitate Christ’s approach to people as you consider your own. Communicate the character of Christ to others. Philip Yancey wrote about authentic Christians in his book, The Jesus I Never Knew, in which he said, “ An authentic Christian communicates grace and forgiveness.” He used examples of the life of 2 Russian philosophers, Leo Tolstoy and Fyodor Dostoevsky, both pursued lives of relentless authenticity. Though they took different paths to achieve their goal, they were no less authentic in their pursuit. They lived passionately through the ideals and the concepts which their lives clung to. Authenticity sets apart those who are longing for something more than complacency. To be genuinely authentic we need to match the inner covering of the heart to the outer flesh covering of the soul. When we spend time in the presence of God our normal is audaciously bold. We can have a perspective rich in mercy, flowing in love, abounding in grace, and multiplied in power. This kind of faith-filled living prunes our lives radically for authenticity. When the radical meets the everyday our views change and our actions follow. We move past the effort to please ourselves, abandoning the veil, and purposing to please God alone. This is the authentic YOU which follows hard after Christ. It is this place of purpose and genuine transparency that allow us to become tools in the hand of God, changing the lives of others simply by being present. This topic is a bit heavy, but it has been weighing on my heart for some time. It is easy to hear the bad reports and even easier to believe them. It is easy to think that you are not affecting others. It is easy to feel that you are spinning your wheels and going no-where. But it is here, in the real everyday situations life brings where authenticity shines. This is your mission field of promise where you can plow and plant seeds of faith cultivated by God’s love. You may not reap the harvest, but I am finding that the greatest act, requiring supernatural faith, is planting the seeds. If you don’t plant the seed, there won’t be a harvest to reap. Living authentically is a radical step of faith. The collision of radical faith among the arid hearts of lukewarm believers is a moment of cataclysmic proportions. AUTHENTICITY is the seed that starts with radical change. Reality changes when our perception of grace warps our natural tendency to judge and serve self. If I am willing to live radically authentic, then I can speak volumes without even saying a word. Authentic living allows for the gifts that are inside of you to manifest in the lives of others to the Glory of God. Step to the edge. Clothe yourself in humility. Jump in with both feet. Be Authentically Beautiful You! So now I want to hear from you! I have included a pdf. journal page for you to journal your thoughts on this topic. What does an authentic person look like to you? What is your definition of Authentic Faith? Journal your way to an Authentically Beautiful You with this journal page I created just for you. I have really appreciated your post. It can be so hard in this world to remember to stay authentic, especially when the world doesn’t agree with you! Authentic Faith puts their Father above all else, even when it doesn’t make sense. That’s is the journey we have been on, an amazing and scary one to say the least, but it is ours. And thankfully, He walks with us everyday! Many Blessings! I appreciate that you shared this,Danielle. It is hard to stay authentic because it feels like we are fighting a fight that is bigger than we are, but I am drawn to 1 John 4:4 when I am weak in the moment. Greater is HE who is in me than he who is in the world. In the spirit of true authenticity, I don’t always remember that right away, and sometimes, I find my own forgetfulness has robbed me of the beauty of staying true to what I know He is working out for His own glory. I am thankful that His presence is the strength to get me through, and I am praying today that you will be encouraged to continue growing in your authentic faith! Bless you! This is a great topic. It can be so hard being accepted but when you stay authentic you find those that truly accept you for you. Stay true to who He made you. Thanks for sharing your thoughts Tamara. I love how you shared the correlation of being true to His design when we stay authentic. Clearly, the authenticity keeps us grounded and closer to His heart and with that our ability to touch others lives is exponential. Blessings to you! I try to be authentic at all times as well. As I’m getting older, I’m surrounding myself with more and more with authentic people as well because life is too short to waste time with those who wear veils! I think there is something significant that transpires as we age and grow in wisdom, we can become more confidant in who we are and the need for the veil is removed. There is an almost instant connection between like-minded individuals where this truth can be recognized almost instantly, and that, I think, opens the door to what the true meaning of fellowship really is. Thank you for visiting. Blessings! Being true to yourself helps keep you true to others too. it is so easy to be distracted and end up struggling but a moment to find yourself and BE yourself is important. Absolutely! I agree that we have to be true to ourselves, or we will find that we are miserable and missing out on the beauty and freedom in transparent living. Thanks for stopping by! Blessings! I’ve always thought that I’m a fairly authentic person. I’m very, “what you see, is what you get.” Sometimes it’s hard to find “authentic” friends and it can be hurtful when you are truthful and real with them and you find out they are a persona of what they feel they should be instead of what they are. Thanks Jenny! I am thankful you stopped by and spent time sharing a thought. I agree that it is hurtful when we are real and it is not reciprocated. For me that lies in the expectation that if I am then others will be. I am learning how precious it is when that kindred heart is found and the fellowship that is a result of that. Thanks for stopping by Buttercup’s and your prayers for Lura. I’d love to visit rural Illinois. I think there’s something wonderful to see everywhere we go and certainly there are great people to meet. I came to a place a few years ago where I decided to just be real. It has been such a blessing to be able to reach out to others because you have revealed your vulnerabilities and it also encourages them to open up and share their burdens. It has come with pain though where you are sometimes judged wrongly or deemed as immature, ‘too open’ or different and I have been tempted to curl into my shell. Thanks for the encouragement and charge. Great post. It is so hard to find or even be an authentic person! It is something that you really have to strive towards. Jesus is definitely the ultimate example, and I work towards that everyday. With Jesus as your guide, you have the very best example! Praying for you to be surrounded by wonderful encouragers who see Jesus in you and remind you of that. Thanks for stopping and for sharing. I love this! Thank you for being “authentic” in this post. The verses were great. I am surrounded by a lot of people who are fake, and sometimes I think I fall into that as well. I need to get better about this. Thanks for sharing! I am so glad you visited, Ali. I think we all need to get better about this process. Praying you will be encouraged each day to remember how much you are loved and valued just by being you! What a thoughtful post. I am most authentic when I pray often, trust G’d and work to be kind and good. It sounds very simple and I wish it was. Being authentic is something I desire but my concern for other people’s feelings have me holding back and not being open/honest. I’ve learned that everyone cannot accept honesty. It’s a delicate balancing act. We should always be considerate of other’s feelings, meeting them where they are. I agree, it is a delicate balancing act. I have found though, that we I begin to look at others through the grace God has extended towards them, that even when I am honest, they receive it. Proverbs 20:5 talks about the counsel of a wise man drawing forth understanding. In that wisdom we can be truly considerate of the feelings of another person w/o inhibiting true authenticity. Praying today you can be encouraged in the gift God has placed in you, to be authentically beautiful you! Thanks for visiting Journeys In Grace. In this world we live in now, it’s exceptionally hard to be authentic. People are ready to sue others or get authorities involved for offensive behavior, because being authentic can offend other people. I’m authentic as much as I can be. The few friends I have are the same as me. The jobs that I had previously have appreciated my authentic personality and was used to get honest opinions. Thanks for sharing is great post. Absolutley Dory! Without Him, our mountains loom large… but with Christ all things are possible! Hi Dawn, this is a very well written post on authenticity. I feel that I am a very authentic person. I’m always honest about who I am, no veil and more junk than the average person. Of course, it helps to be honest about the junk when you have overcome it or when you feel you won’t be judged. I became an overcomer many years ago due to a broken heart. It caused me to change my life around, to seek a better life that would bring happiness and fulfillment. I hadn’t had a religious or spiritual upbringing, but I did eventually turn to God. I read the Bible, was born again and baptized. I think authentic faith would be revealed in a person’s actions. They would in fact be like Jesus. Blessings! So thankful you were able to overcome the pain you experienced. I am even happier to know you found the Lord. All those wonderful things you learned in your journey are the tools that make your authenticity even more appealing. This post really hit home. My last day at my old job was yesterday. The company touted their “Christianity” but did not show it. That was just one of the reasons, that I decided I could no longer work there. I believe that you shouldn’t have to advertise your faith. If you are truly living what you believe it will show. Thank you for reminding me to live everyday based on being authentic and not hiding. I have been hiding for a lot of years because of fear and lack of confidence in my abilities, thus someone capitalized on that for their own benefit. Thank you for visiting my blog, and for sharing a comment. I appreciate your time. This was a very thought provoking post. I thank you for that. Authenticity is definitely something I strive to be every day, but there are times when it is hard. Like you, I am a perfectionist and I think sometimes that takes away my authenticity. I really enjoyed this post. I am so glad you dropped in to Journeys In Grace. Authentic living is definitely scary and the possibility of rejection is often high, but when I truly let myself be real, I am usually abundantly blessed because of it. Likewise, those who are with me feel the walls retreat and everyone begins to breathe. 🙂 Pryaing for you to have the confidence to walk in the beauty of you. What a neat post! I think an authentic person is a person who is herself/himself no matter the situation. Idk if that makes sense. But like, that sweet fun loving girl at church, is she the same if you meet her at the grocery store, or at college/work? I guess someone who does not just talk the talk but actually does the work? Oh gosh now I realized how hard it is to try and explain. Me definition of authentic faith is trying your best to uphold gospel principle even when you are not at church. Trying to be nice to your fellow man, pray for strength or whatever it is you need throughout the day. I don’t belong to the same church or agree with everything they do but The Duggar’s from “19 kids and counting” seem to be a good example of authentic faith. They seem to act in accordance to their faith because they really feel it’s the right thing to so and not just cause someone told them to. Wouldn’t it be awesome if we all were able to follow the Golden Rule? 🙂 It is those people who truly look at others as better than themselves, elevating their ability to see how special each unique person truly is in God’s view, which seems to be the sharpening tool that helps me to be authentic. One of my favorite speakers, Andrew Kern, shared this thought, “When we realize that we have more in common than we don’t, we realize we can all have some familiar ground to stand on.” This type of perspective means we can find something that connects us all and give us the opportunity to relate, and if necessary, debate in grace. You really summed up the word authenticity perfectly here: “Authenticity allows the beauty inside to manifest on the outside.” It is so difficult to keep up with our surroundings, our friends, colleagues, careers – without the temptation of losing ourselves and not being true to ourselves. I find this a challenge with every encounter. But once authenticity is apparent in both myself and those I interact with – I feel trust is built and relationships soar. Which is why Jesus is the perfect example for us to follow. I love this! I am taking Ali Edwards, One Little Word class and this is my word. Be! I am striving this year to BE, Be me, BE real, BE myself! Thank you for this beautiful blog post, it was just what I needed to read. So glad you stopped by. I remember your sweet blog. My daughter is so thankful I visited you to get some ideas on making her scrapbook, finally. I am praying that you can soar high in the beauty He created within you. Being exactly who you are, filled by His light, is a gift to us all. I think this a beautiful way of life. I’m struggling with being myself at the moment. My husband has just ended our marriage and I feel like I trusted him with the authentic me and he rejected it. I wasn’t good enough to make him happy. Now I am trying to be true to myself by standing by the marriage when he has given up, but it is hard. I feel safer hiding behind a facade rather than facing rejection again. But I still try to be open and honest. I am who I am, nothing will change that. I am praying for you… for hope, restoration, and healing. Your comment touched my heart and I just want to remind you how beautiful you are. I read a book by Angela Thomas called, “Do you think I am Beautiful?” It was a blessing for me at the time that I read it. Thanks for sharing your heart. I pray you will be encouraged today and reminded just how precious you are to your Heavenly Father. Hi! I enjoyed reading your post and I agree with you when you say it takes courage to be you. You are absolutely right. It takes courage to personally and professionally really just be the you that God created and is still working on. You absolutely will get bumps and bruises along the way from those that don’t appreciate the value of authenticity but it is worth it. Being comfortable in your skin is a true blessing and it also enables you to help others because you are coming from a more honest place. What great thoughts! Being authentic is something I need to work on. As a mom I live for my kids and sometimes I need to take time to truly be me. Thanks for the reminder! Great post- I am a ‘wear your heart on your sleeve’ type of girl, so this post spoke right to me! I am so glad you stopped by, Becky. Some of the most beautiful people are those who share their hearts so openly that we can see it as badge of grace. Praying you will be encouraged as you continue to be authentically you! It can definitely be difficult to be authentic in this world when so many of us are afraid of what others will think. We have to remember this is not our home and we are here to be authentic in our actions to spread the Word. What good would the great commission be if no one was authentic? I love your question, Amber. If we took the time to ask ourselves these hard questions more often, perhaps the concept of authenticity wouldn’t be foreign and the fear of others opinions would pale in the light of His opinion. It is actually an inspiriation to be more authentic and speak His Word with abandon. Thanks for sharing your thoughts and the inspiration. I am a people pleaser too. That makes it super hard to be authentic and honest with myself. I think that may be the hardest thing to change. When we surround ourselves with people who are authentic and loving, it makes it a little easier. Thanks for the uplift. This is a wonderful post to remind us how important it is to be who we really are. It is hard sometimes in such a judgmental world, but it would be boring if we were all the same. I’m full of gratitude to be part of an amazing community of deeply connected women in a state of true authenticity and transparency! It means the world to me. You are truly blessed to have that gift, Rachel. Friends who are authentic and encourage you to be real, as well, are a blessing. Your post is beautiful. I can really tell that you are an authentic person. I try to please people as much as I can. Saying “no” can be difficult at times. I think that’s something my mom passed down to me. I try my best to be authentic. Thank you, Desiree. I am so glad you were here. Saying no is hard, when we are people pleasers, but is also necessary to take a step in being able sift out everything in our lives so that we can choose the best things. I pray you will be encouraged to be strong in your own beautiful authenticity! An authentic person is someone who is true to herself and doesn’t worry about society and its stigmas. I think Authentic Faith is the genuine desire to build and strengthen your relationship with God despite what others may think or say. Absolutely! We are following after the master when we forsake everything else and seek Him first. I am so not authentic when it comes to my faults. I feel like many times if I am authentic, then people will view me as a failure. Guess what, I am! I love when people are open and raw, but many times I am not. I need to work on being authentic. That response was fully authentic! It is in that place, when we realize those sweet truths that authenticity blooms. And can I tell you a secret, it is the fault lines in our vessel… those visible and hidden cracks… that make us truly beautiful. I am confidant you shine when you are just being you. I am who I am, I lay it out there! I believe someone is authentic when they are the same under different circumstances, also the same when they are either with you or without you. Unfortunately, there are many fake people out there today. As you mention, we have a great example of someone who was totally authentic – Christ. And He is the perfect one to imitate! This was a great post. I was just talking to a friend yesterday about being ones authentic self. Thansk Mercedes! It is so hard to be authentic, but I am finding that the blessings outweigh the discomfort. Praying you will be encouraged in your gifts today! We can so easily fall into the trap of being what others want us to be and not what God intended us to be. Thank you for this great post.